Scrangie: Intro to Spooning: How does it work? Here's a little step-by-step guide to help you get acquainted with the idea of Spooning with Zoya. It may seem a little strange at first, but you'll end up hooked on Spooning in no time! First, you visit zoya.com and pick out spoons of colors you're interested in- I am using Tosca as an example because it's the first search result, but Zoya Spoons are available in every color. http://zoya.com/content/38/item/Zoya/TOSCA-SPOON.html <-- First step: get spoons! Then, in a couple of days, they'll arrive in a pretty little Zoya envelope! Oooh, aaah! Neat! So... step 2: open the envelope! 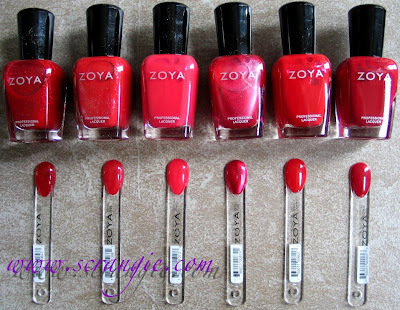 (With these particular spoons, Zoya demonstrates how to pick your perfect red). Note the item number and shade name clearly printed on the handle. No hand-scribbled sharpie smudges here, these are neat and professionally labelled, bar code included! Step three: Try on the color! Here's the beauty of spoons: they fit over your nail to give you a clear idea of how the color will look on your actual nails! They're on the large side so I am using my thumb as an example. Hmm... not sure I like the oval nail shape on me! Haha! The color you see in the spoons is what you get on your nails. No more confusing or misleading stock photos that make you buy the wrong color! Jade, Nidhi, LC, Ruby, Carmen, Andi. When you purchase Zoya Spoons (50 cents each), Zoya will email you a code for the value of the spoons. It will also be available in the "My Account" section on Zoya.com so you don't lose it. So say you order $3 worth of spoons like there are pictured here... You'll have a $3 credit toward your next purchase via a one-time-use code. That leads me to step four: Order your polishes with the spoon credit! You don't have to buy the same polishes that you picked spoons for. You can pick any polish. Maybe some of the colors didn't work for you, or maybe you want some Armor topcoat instead of another polish color. The Spoon credit code will go toward any color or treatment. The spoons end up basically becoming free previews. Pretty sweet, eh? I think this is an awesome idea for online polish shoppers and I wouldn't be surprised to see other companies 'borrowing' this idea in the future. It's way more useful than that completely inaccurate color picker with the photoshopped hand that you see on some other salon brand polish websites. You get to see the actual color, in person, against your very own skin. "What's a Zoya Color Spoon? 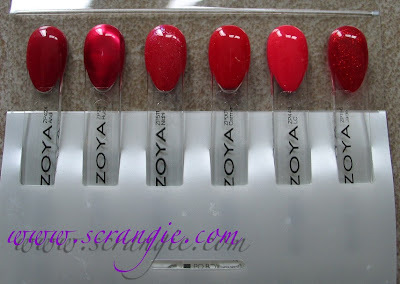 Zoya Color Spoons are clear plastic, spoon shaped devices with actual nail polish poured in the nail shaped tip. Before you order a bottle of a color you are not sure of, order a color spoon of that color instead. You can order as many (or as few) colors as you would like. When you receive the Zoya Color Spoons, simply hold them up to your nails and see what the actual color will look like on your nails as though you applied 2 coats and a clear top coat. You never have to worry about ordering the wrong color again. Ok here is the best part: Zoya Color Spoons SHIP FREE (Economy Ground). That's Right, weather you buy 1 or 200 spoons you do not have to pay for shipping unless you want to upgrade to faster shipping. So how much are the Zoya Color Spoons? Well they are basically FREE. When you place an order for Zoya Color Spoons you are charged $0.50 per spoon, but as soon as your order is invoiced and ships you will receive an email with a personalized promo code for a discount in the amount equal to the amount you spent on spoons to be taken against you next order.You can use your coupon code towards the purchase of the real color you want to buy or any merchandise on our websites. You can even use it to buy additional color spoons." Though, I am slightly confused about that last line because in the fine print on the press release it says you can't use the code to buy more spoons... Here it says you can use the code to buy more spoons. I'm not sure which is correct! Color spoons are available now on Zoya's website! This is really neat!!! I'm going to try it out, thanks!! I love the idea. Sadly I can't make use of it since I don't live in the US, but still, great idea. This sounds awesome! But I checked and I really want to order spoons for the Wicked and Wonderful Collection and I don't see any. This is a really fabulous idea on Zoyas part. Zoya's not for sale anywhere near me, and while pics posted on nail blogs certainly help get me jazzed for a collection from them there truly is no substitute for getting wowed in person. China Glaze, Orly, Sally Hansen and $OPI/OPI always end up getting all of my polish dollars for that reason no matter how much I admire a Zoya, Nubar or RBL collection online. This might help earn them some of my play $$! I've said it before, I'll say it again...this is absolutely genius! Super neat. My only question is, do the spoons accurately show sheerness? It says that the colour is poured into the spoon but it also says that the spoon shows what two coats plus top coat look like. "Poured" does not sound like the same coverage as two brushed on coats. This does sound awesome though. I hope other companies follow suit. Oh man those are awesome! This is such a great idea! There have been times I've wanted one color, chosen the wrong one, and been stuck with the one I didn't want. YAY ZOYA! I think this is a great idea. Not sure it was worth being spammed on Twitter & fb by them all week for, but it really is wonderful to be able to see the actual colours of the polishes. My only question is do the discount codes expire after a certain time period? I be all these spoons are going to end up in landfills. Very nice idea from Zoya, thanks for introducing it to us. Sadly zoya.com doesn't do international shipping (I live in Europe). Love this idea. I've always loved nail wheels and such cause it shows you what the color is like out of the bottle. So it's for Americans only? Cos that would've been good to know before I got all excited. I think this is a really innovative idea. It's really going to make online nail polish shopping a lot easier. It will save me from the frustration of not getting the right color!! This is an amazing idea! I can't believe that more companies don't do this! Bravo to Scrangie for this incredible "how to" breakdown. We are happy to see so many of you excited about the new Zoya Color Spoons. This project has been a big secret and close to our hearts for some time now - it's a good feeling to have them so well liked right from the get go. New collections will be released as Zoya Color Plates reflecting the entire collection. For a limited time, Zoya will be shipping a FREE Wicked and Wonderful Nail Plate* with every Zoya Color Spoon order. *Limit one per customer. While supplies last. I am with Skulda. I am a bit concerned about the waste factor... a bit disappointing as Zoya prides itself on being more eco-conscious/"natural". The old-polish trade-in was even billed as an Earth Day event. But AFAIK no other company sells spoons directly to individuals-- I've seen similar things at some places that carry OPI, but they're the store's set, not for sale. It seems to encourage the manufacture of a TON of plastic that has very little reusability, a very short span of usefulness, and no way to recycle. the spoons would have been a less extravagant use of plastic if full tester sets had been issued to brick-and-mortar stores, rather than sold direct to the consumer.